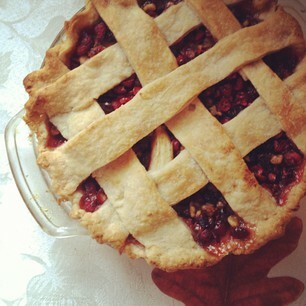 Oh my goodness, your photo made my mouth water; I love cranberries and must try this one. 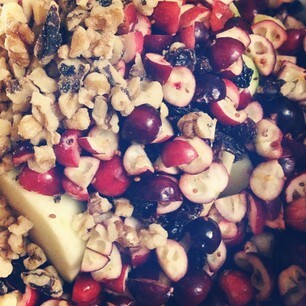 That combination of apples and cranberries, with raisins and nuts, looks so inviting. Beautiful pie. I'm usually to lazy to do a lattice, but yours looks so pretty. 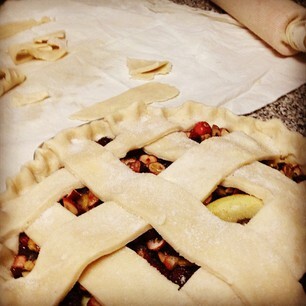 I love cranberries and apples so this sounds like a great pie to try. You are so smart to get an early start. Looks wonderful! We were the family pie bakers for awhile. Like you, we found we had to do practice pies to make sure we were ready for the big event and, eventually, it was entirely too much pie! But it was fun while it lasted. Wow, great looking pie! There's a lot of delicious things packed in that pie. No wonder there wasn't a piece left! I am an absolute failure when it comes to pie making, but I have a friend who will love to try this recipe. Thanks for sharing it. The pie looks heavenly, but I'm most impressed with the idea to celebrate Canadian Thanksgiving. I want to try a new turkey brining recipe, but hate experimenting on the 'Big Day'. Maybe I could host a belated Canadian holiday next weekend... thanks for the inspiration! At first glance I thought the title of this post was Cod Pie. Glad that's not the case. This looks delicious. A perfect fall treat! this look amazing. I am not sure whether I like cranberry enough to try it. Yum, the flavours of Fall! I'm thinking that looks really good. Looks delicious! I wonder if I could leave out the walnuts. carol: I think it would be fine without the walnuts - they're really there for texture more than anything else. Just up the amounts of the other ingredients and I think you'd be fine!